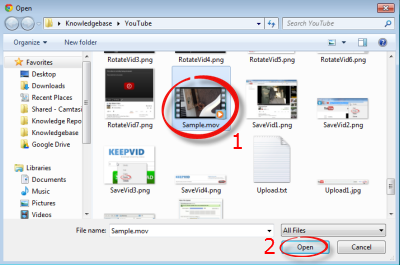 How to upload a video from your computer to YouTube after you've created an account. Step 1:Sign in to your YouTube account (http://www.youtube.com).Step 2:Click Upload at the top of the page. Step 3:Click the arrow to upload a video. 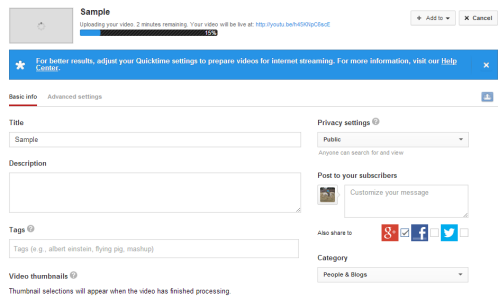 You can choose the privacy settings now or wait until the video is uploading. Public means anyone can search for and watch the video. Unlisted means only people that have the link to the video will be able to see it. Private means only you can view the video. Click here for more information on privacy. Step 4:Locate and select the video on your computer. Click Open. 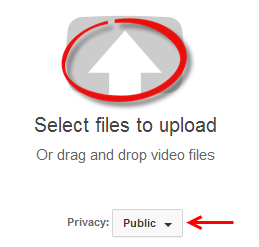 Step 5:While the video uploads, you can enter the video information and settings. Step 6:Click Save changes in the bottom right corner if the setting changes are not automatically saved. Video For more information on uploading videos, visit this Hoonuit video.